A long time ago, in a galaxy far, far away, an Uncommon Geek experienced a story of heroism and adventure unlike any other. That story was Star Wars. Before I start an actual review of this movie, I would like to point out that, when I say that I am reviewing Star Wars, yes, that means I am covering “Episode IV: A New Hope.” George Lucas may have referred to this film as Episode IV from the onset, but, despite what the man claims, empirical evidence suggests that this is indeed the intended beginning of his tale, and that not everything in the story was planned out from the beginning. The movie was released theatrically as simply Star Wars, and that is what I shall always refer to it. This, “A New Hope,” IS the first Star Wars movie, chronology be damned. I would also like to answer the question which I pose to myself, and the one that I am sure will cross the minds of others: is there any real need for yet another review of Star Wars? A basic internet search would yield hundreds and even thousands of hits for reviews of this revered franchise. I don’t doubt that many of the things which I am about to say, have been said already in some form or another. But what it comes down to is this: I love Star Wars. I have since the first time I ever watched it as a child, and I appreciate it even more today as an adult. Although Star Trek may be my greatest love in the world of science fiction, I have a deep, passionate affection for the original Star Wars trilogy, and it is never not fun to talk about! 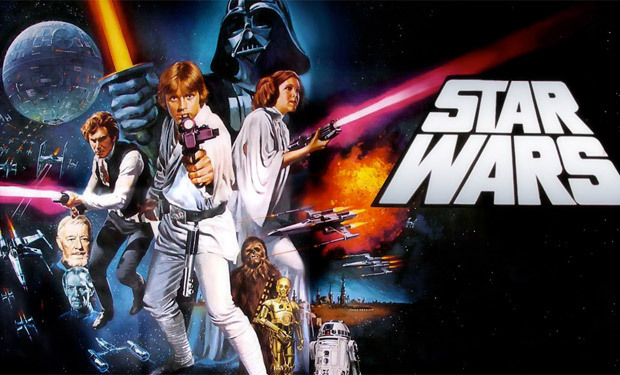 Star Wars hooks you from the moment its logo explodes onto the screen, accompanied by John Williams’ legendary score. The movie wastes very little time. A brief exposition explains the basic premise, and from there, the action begins in earnest. No credits, no fluff. As questionable as his decisions may be in more recent times, I absolutely respect George Lucas’s defiance of the Directors Guild of America via not including introductory credits in his movie. I actually prefer when films omit opening credits. If you have closing credits anyway, why bother? I wish that I could have seen this movie in theaters in 1977, to experience it for the first time the way my father did. This was science fiction, space opera action the likes of which had never been seen before. The images, the sound effects, and the music are so instantly recognizable, and are unmistakably iconic. Examples such as Star Destroyers, stormtroopers, astro droids, and of course Darth Vader himself, are all now permanently engraved into Americana. The first impression that Darth Vader makes is striding onto Princess Leia’s ship through the fog of battle, towering over everyone, and then choking out the first rebel he captures… it’s an incredible entrance. Within seconds you know that this guy is bad news, and he is not to be trifled with. Even in spite of George Lucas’s meddling, the Darth Vader of the original Star Wars trilogy is still one of the greatest, most badass villains ever conceived. The beauty of Star Wars is also how easily it can appeal to people of any age. Right from the outset, C-3p0 and R2-D2 provide a great deal of comic relief, and they lend a certain appeal to kids for sure. But it is not in such a blatant way as to feel like that this movie was meant for kids. Having broad appeal and being made for kids are two very different things. On Tatooine alone, we get to meet aliens and droids alike that run the gamut from being cute, to creepy, to just outright weird. Speaking of aliens, many of them who we are introduced to in this movie are not very friendly. The principal protagonist of the tale, Luke Skywalker, has a near fatal run-in with the Sand People of Tatooine. As well, an alien bounty hunter intercepts Han Solo, the man hired to fly Skywalker and his mentor, Obi-Wan Kenobi, to the planet Alderaan, and threatens to kill him for the price on his head. In the proper, original, unaltered version of Star Wars, Han Solo, a likable but dangerous smuggler, shoots the bounty hunter, Greedo, in the Mos Eisley cantina without a second thought. Greedo never shot, at all, yet George Lucas, in his 1990s re-mastering of Star Wars, added in a pathetic altering of this scene which has Greedo firing first, yet somehow missing despite being two feet away from Solo, and having had his gun trained on the smuggler the entire time. “Han shot first” has become something of a cultural phenomenon in the geek world. Lucas’s alteration of that scene, among others, undermines the strength of Han Solo’s character, and is an unneeded, unwelcome change to a story that was just fine that way it was. I do not intend for this to become a diatribe against the sins of George Lucas, I merely wanted to point out how this original, theatrical release was so much stronger without any additions or alterations, and that it was already as good as it could possibly be. What Star Wars accomplished in 1977, was nothing short of a complete re-vitalization of science fiction in modern media. George Lucas didn’t craft the most original story ever, but what he did is take the all-time classic literary vehicle, “the hero’s journey,” and transposed it into a living, breathing, vast, dangerous, yet beautiful fantasy universe. It really is more like high fantasy within the trappings of science fiction. By introducing us to The Force through the eyes of our hero, Luke Skywalker, Lucas touched upon an ideal that exists within the hearts of many, especially the disheartened and the disenfranchised. That ideal, was that we each had a hidden potential that was just waiting to be unlocked, that we could rise up, like Luke, and becomes heroes in our own way. Particularly in 1977, a jaded and fairly embittered time in the United States, seeing such a hopeful, heroic, and optimistic take on action and high adventure on the big screen must have been a more invigorating escape from reality than I can imagine. We take such escapes for granted in this generation of the internet, mobile devices, and video games. Star Wars also, through the concepts of The Force, and the struggle between its light and dark sides, has a certain universal appeal that transcends cultural barriers. While the Jedi and Sith may be Force practitioners in a such a way as to resemble a religion, The Force itself is sufficiently divorced from religion as we know it in our world, to not be synonymous with it. If we ignore the nonsense which Lucas introduced in the prequel trilogy (and I choose to), The Force is simply an energy field created by all living things. It does not necessarily have a will as we understand it, but as with all things in nature, it does seek to balance itself out if pulled to one extreme. Further, in Star Wars proper, The Force is shown to have more in common with strength of will, and is more tied to metaphysics than the idea of a divine entity. Although Darth Vader and Emperor Palpatine, in The Empire Strikes Back, would go on to talk of destiny and foresight through The Force, this is also arguably a representation of will, and not just some mystical entity pulling the strings of all the characters involved. And let’s not forget the final battle that the Rebel Alliance undertakes against the Imperial superweapon, the Death Star. Nothing like this had ever been seen before in space combat. It set a new standard in space action that even movies today rarely match. Aside from a few silly moments that are easy to pick on after you’ve seen this movie dozens of times (like Porkins…), this is still one of the most exciting and engaging pieces of action in science fiction history. I have watched Star Wars… easily a hundred times, and I still get goosebumps when I watch the trench run. John Williams’ score, which is something that is this point as important to Star Wars as lightsabers and The Force itself, makes this sequence even more pulse-pounding and exciting than it already would have been. The original effects and ship models still hold up well today. The men and women who worked on theses effects in 1977 did a tremendous job with the time and money constraints that they were under, and their work stands the test of time. I don’t know of any other way to re-iterate just how good this original movie is. It isn’t perfect, and I still think that The Empire Strikes Back is the best Star Wars story ever told, but this first movie is still a cultural touchstone that is permanently engrained in our society. Even in parts where it is obvious that this film was designed to stand alone, or where it is obvious that Lucas didn’t really have the whole thing planned out (even though he claims that he did), Star Wars still holds up as a remarkable piece of space opera, science fiction, fantasy, high adventure, and has the kind of enduring, universal appeal that can touch people of any age, and any culture.